Roasted Sweet Potato & Pecan Salad. PLUS, a Quickie TV Appearance! | Keep It Up, David! 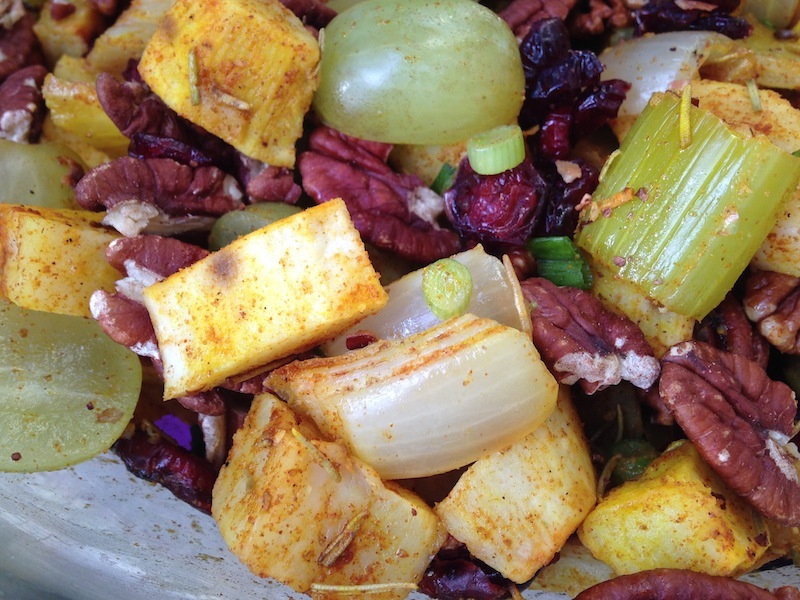 Roasted Sweet Potato & Pecan Salad. PLUS, a Quickie TV Appearance! 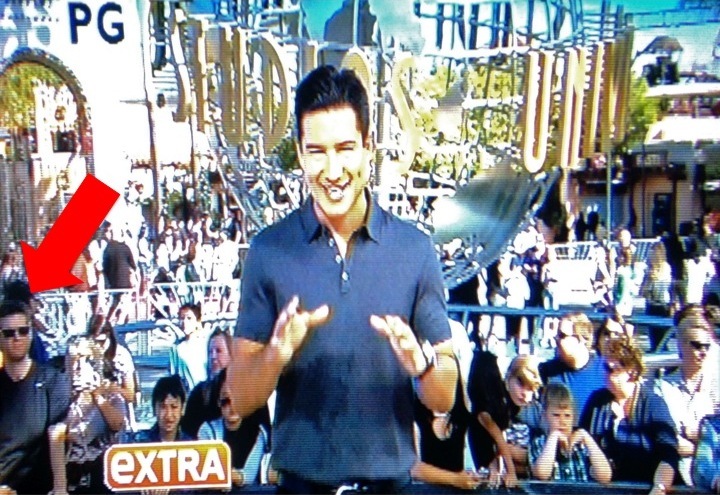 I went to Universal Studios Hollywood yesterday, and as I was leaving, they were shooting the entertainment news show “Extra.” I watched the host, Mario Lopez, do about ten minutes of intros and promos, and what did I see when I tuned in later that night? I was on TV! It was just for a second or two, in the lower left corner, but it was cool nonetheless. I don’t know if I popped up later on in the broadcast, because in Los Angeles most of the show was pre-empted by breaking news coverage of the situation in Missouri. I was at Universal Studios for a workout. There’s a 345-step stairway there, and I spent about 45 minutes climbing before going on a few rides. You can see all sorts of pictures in this blog post, or check out my Twitter feed for photos from yesterday. I ultimately climbed roughly 108 stories, and did it on an interval, so it was exhausting. I shared my 2014 Thanksgiving Pledge yesterday, which will let me enjoy the holiday and eat whatever I want without guilt or remorse. Today, I’m sharing a new recipe that’s perfect for the Thanksgiving table. And it’s healthy and delicious, too! 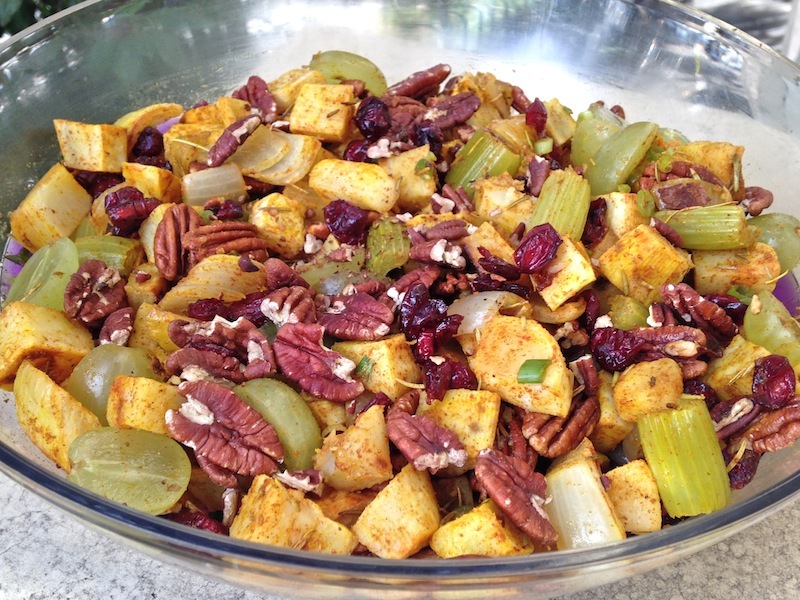 Roasted Sweet Potato & Pecan Salad. This recipe is based on one from a Food Network show called “The Kitchen,” but I made a bunch of changes – reducing the oil, eliminating an ingredient I don’t like (pomegranate seeds), replacing an ingredient I don’t have (a spice blend called ras al hanout), and a couple other swaps. I preheated the oven to 400 degrees. 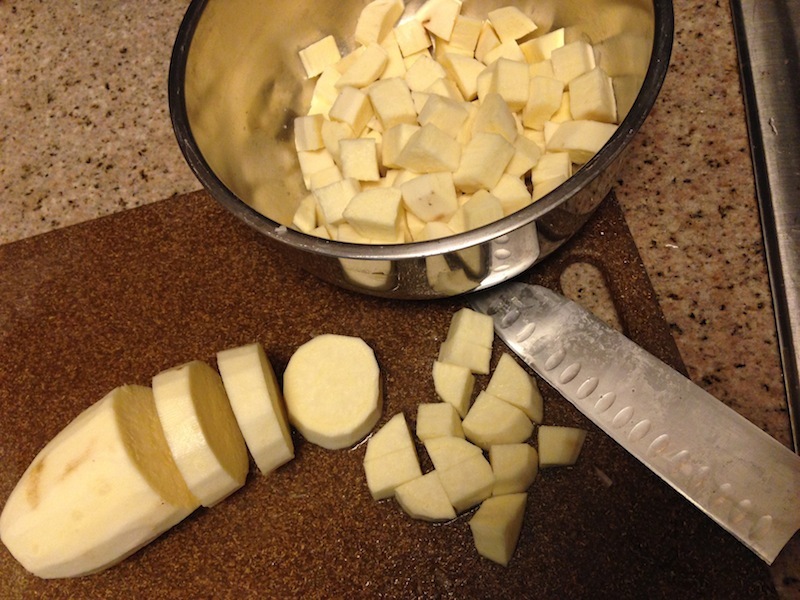 I peeled and chopped two sweet potatoes into cubes. Just make them bite-sized and consistent, so they cook evenly. I used the white sweet potatoes, but orange yams would work great, too, and they’d be more colorful. 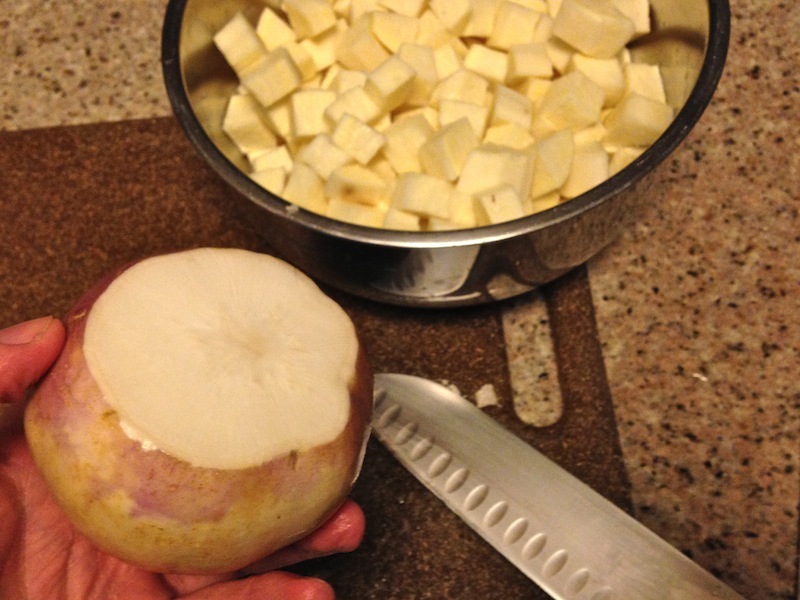 I also added a turnip, peeled and chopped into similar-sized pieces, because I wanted to use it up. 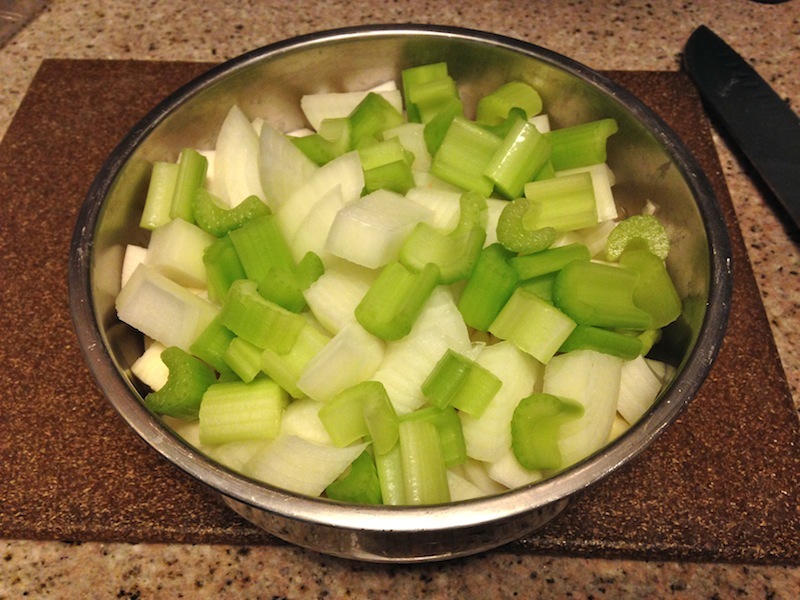 Next I chopped one white onion and four stalks of celery into similar-sized pieces. I wish I had a red onion, for color purposes, but I used what I had in the house. 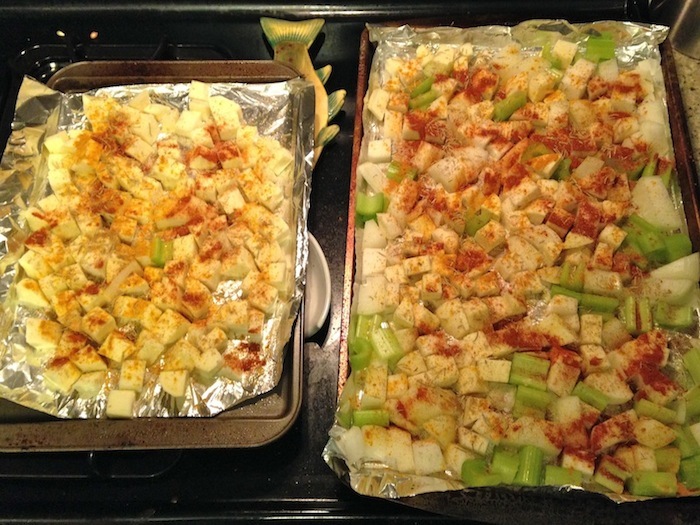 I lined two sheet trays with foil, slicked them with Pam, and spread out all the veggies. Time to season them! I sprayed a touch more Pam on the veggies, so there’d be something for the herbs and spices to stick to. I liberally sprinkled six things on everything: cumin, turmeric, ground coriander, paprika, rosemary, and finished it off with a little salt. 1 bunch scallions, thinly sliced. The last ingredient was 3/4 cup dried cranberries. I added all those extras into a big bowl with the roasted veggies. 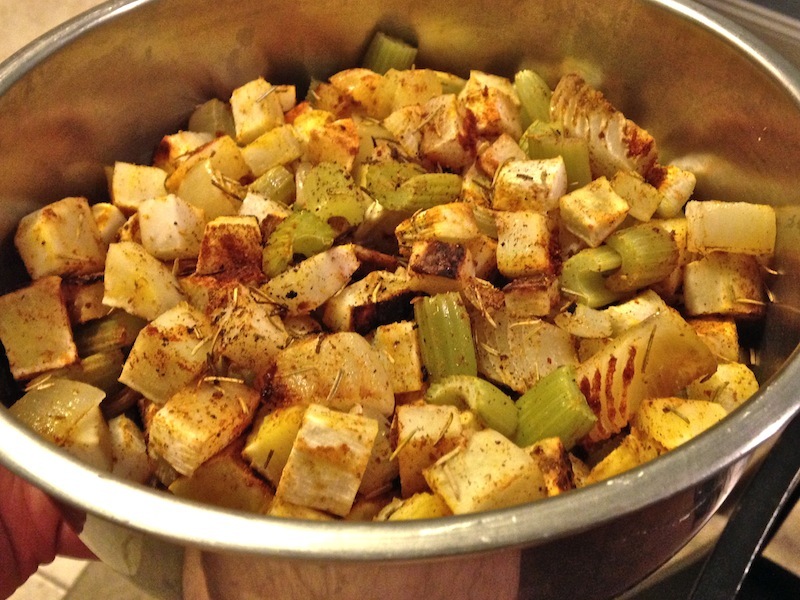 To dress it, I used 1 tablespoon of olive oil (that’s right: just one tablespoon in the whole bowl!) and 2-3 tablespoons red wine vinegar. Toss is all together, and serve it up! There’s a great array of textures and flavors. It’s sweet, smoky, smooth, refreshing, and surprisingly light. 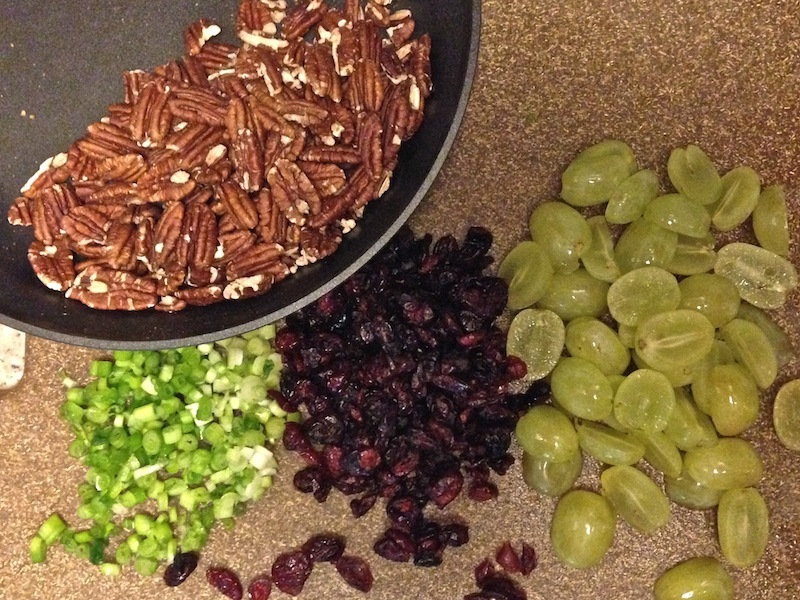 The pecans add crunch, and there’s two great oniony flavors: the spiced and roasted white onion, and the much milder scallion. It was a hit at the potluck: I brought home an empty bowl! This entry was posted on Tuesday, November 25th, 2014 at 12:01 am and is filed under Uncategorized. You can follow any responses to this entry through the RSS 2.0 feed. You can leave a response, or trackback from your own site.